These two. 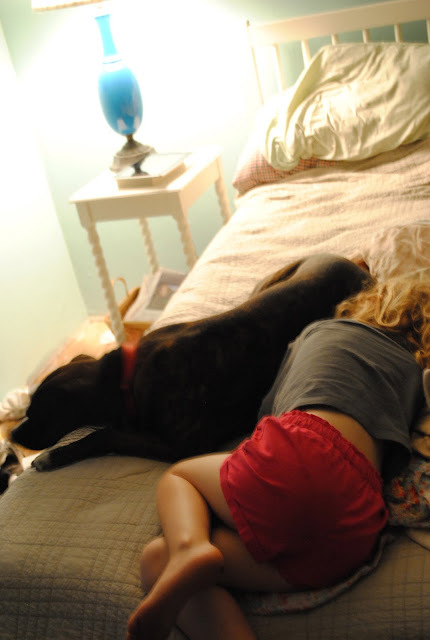 They sleep together every where, but most recently, they have been landing in our bed at bedtime. On this occasion, I asked Avery if she could go brush her teeth, but she said she was too tired. One minute later, she was snoozing. Early this morning, while night birds called each other, Coco sat up and jumped off the bed, waking me up. She was after something and I thought it was Sylvie. I pulled the covers back and looked down to get out of bed to see a baby skunk run under my side of the bed, while Coco ran out into the hall. After an hour and a half of coaxing and problem solving, our smelly guest returned to the out-of-doors without leaving a trace of her perfume. Close call? Yes. Thankful the dog was on the bed to alert me of intruders? Double yes. Make sure the doors and any openings are shut in case of future visits or under the house camping. Returns probable. YIKES! At least we only had possums trying to set up residence.